You know, it's amazing how we turn a blind eye as society to our heroes flaws and weaknesses, whether it be our football stars, politicians or musical icons, be it drugs, tax evasion, adultery, or domestic abuse. 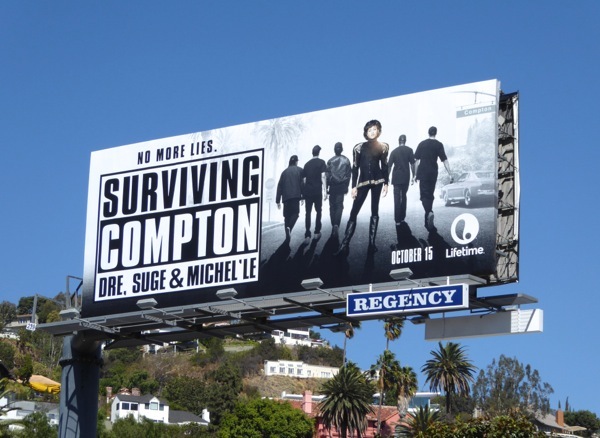 Lifetime's new TV movie Surviving Compton looks to set the record straight on one urban fable though, with Michel'le telling her side of the Straight Outta Compton story in a new made-for-TV movie biopic on Lifetime. 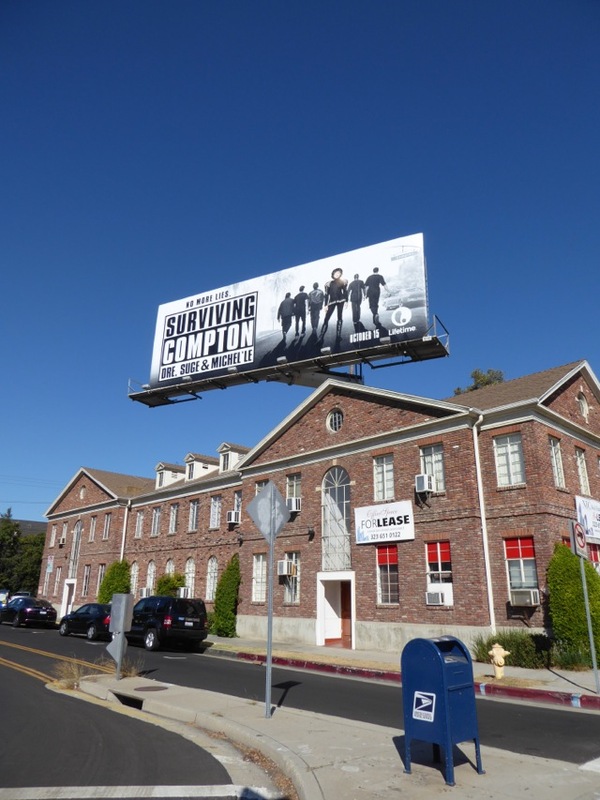 The film will take a closer look at her abusive relationship with Dre from iconic rap group N.W.A. 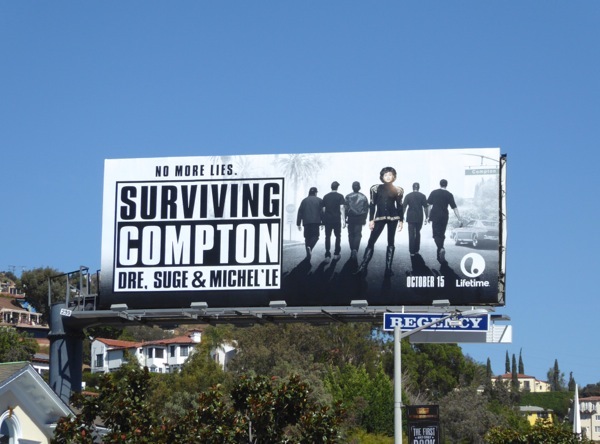 and also her invalidated marriage to Suge Knight (who was married to another woman at the same time), with Michel'le played by actress Rhyon Nicole Brown. 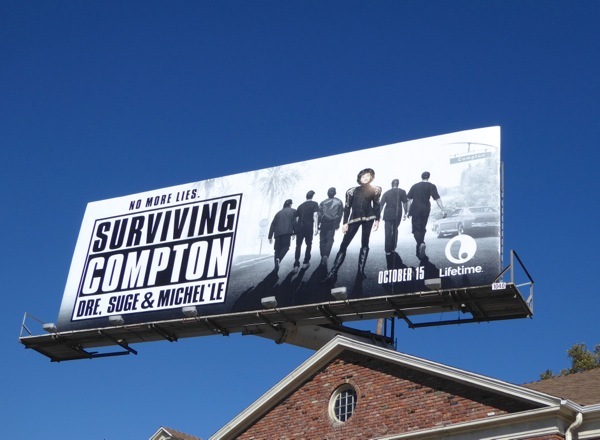 These Surviving Compton TV movie billboards, paying homage to the Straight Outta Compton movie billboards from 2015, were first snapped along San Vicente Boulevard at Wilshire Boulevard on September 30, then later above Sunset Plaza on October 3, 2016. For more of Lifetime's music biopics, make sure you also check out this Whitney TV movie billboard, these Aaliyah: The Princess of R&B billboards and this Toni Braxton TV movie billboard. 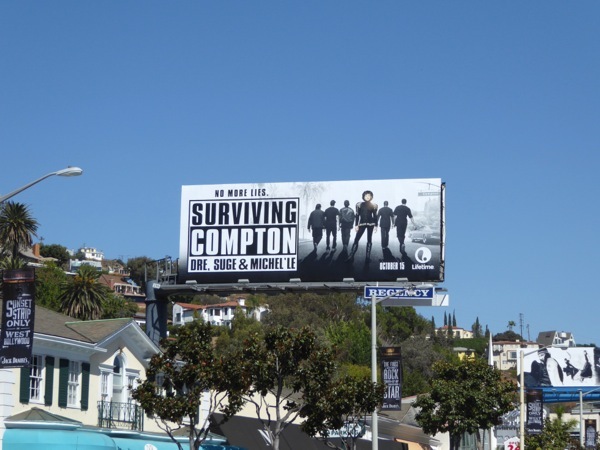 Let's see if Michel'le's account of things will score as high viewers as the Straight Outta Compton movie did at the box office, which has grossed over $2 million worldwide at cinemas.